This written pattern goes with the video tutorial. It would be too difficult to properly and thoroughly explain how to put the parts together here in written form so make the parts here and view the video to put the pieces together. I do include the order in which the chair should be assembled under the written pattern below. 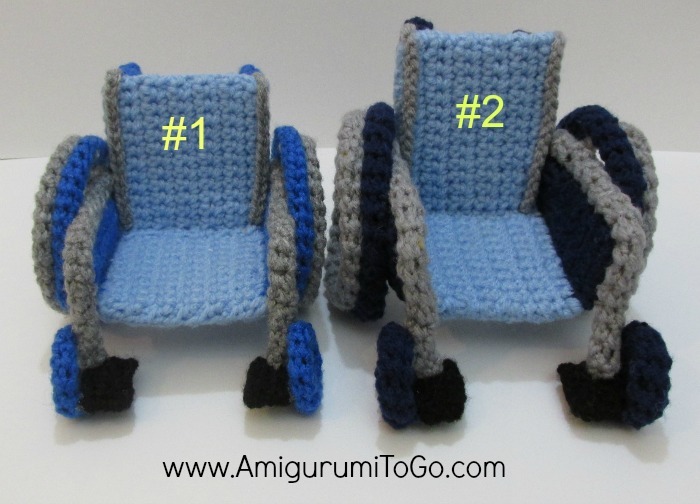 Special notes: Some of the parts of the wheelchair will also get plastic inserts so it is important to use the same weight yarn and hook size as given in the supplies list. 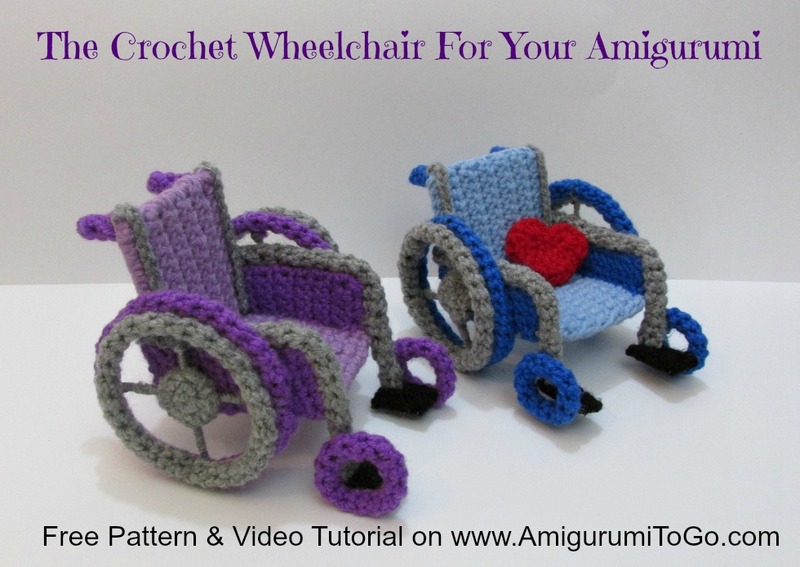 If you make a smaller or larger wheelchair with a different size hook and different weight yarn then you will need to adjust the size of the plastic inserts and most likely will need to adjust other parts as well. 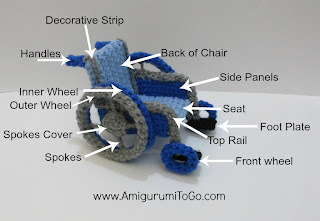 If you make a larger wheelchair, also keep in mind that the pipe cleaners will not be long enough unless there are longer pipe cleaners out there I'm not aware of. You could use wire but you will need to pay more attention to the shaping and so on. You can make the back of the chair taller or wider or both without changing anything else in the pattern. To do this just increase the number of chains in row 1 in the pattern for the back of the chair and the seat of the chair. Chair #2 has 15 chains in row 1 of the back of chair and chair #1 has 13 chains in row 1 of seat.. I wouldn't go too much taller or wider as this might compromise the stability of the chair. Decorative Strip Along Back Of Chair: Make 2 with any color. This clip was lost and left out of the video tutorial. But there is a clip showing how to attach it after the chair is fully assembled at the end of the video. Tube Running Along the Top of Side Panels: Make 2 with grey * if you begin with a long starting tail then you will not need to add in a sewing tail later when adding the foot plate. I didn't do this in the video tutorial. 2) aside from the handles each yarn tube gets stretched out to a certain length. The lengths are approximate so watch the video tutorial for a better understanding of this step. Do not cut the excess pipe cleaner free until you are sure the wheels are at the right length. 8-c) whip stitch the remaining side panel pieces onto each of the pieces in 8-b. Assembly of solid wheels: Cut out 2 large round circles and 2 small round circles from a plastic mesh sheet or a margarine lid and those will be placed inside the wheels for strength. Sandwich a piece of plastic between 2 larger wheels and whip stitch neatly around the edges. Sew the smaller grey piece in the middle. Pin wheels in place and add glue in the very middle between the chair and the wheel. Let the glue completely dry then sew the rest of the wheel to the chair. I hope you enjoyed the pattern and if you have made one please post pictures on my facebook page! Thank you so much for sharing your talent... I love this pattern!!! I am new to Amigurumi and to try to make something like this was going to make me crazy!!!! I am in a wheelchair and was I ever surprised to fin this wheelchair, totally by accident. I will make at least one for sure. Lovely work Sharon! Love the details you put into this design! I find it such a useful toy for so many children! Thank you. thank you very much. I just had a looked and found the post and thanked everyone personally for all the great comments. That was awesome! In the next couple of days I'll be sure to put a post up about the Crochet Lounge on my page Amigurumi Freely. like your pattern. 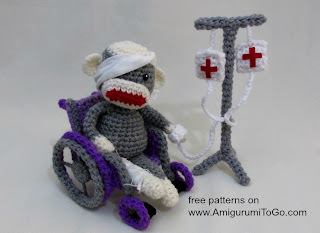 i'm in a wheelchair but i can't crochet only knit. i wish there was a knitted pattern out somewhere. This is a fabulous idea and I'm sure many little ones will enjoy being able to have a wheelchair for their plushie friend just like they have! So did you ever crochet a cover for your daughter's cast to make it purple? This is an amazing design I work with mobility challenged seniors who are so talented and are so eager to make these thank you! Hi. I had a question. I was wondering if this would support a 18" crochet doll? With some adjustments of course. I work as a volunteer with "Feel Better friends" and a group of us crochet dolls for sick kids that resembles them with all their scars and such. My current assignment has a little girl in a wheel chair. Any help would be appreciated. Thank you in advance. So cool!! Do you have a list of the characters that fit in the wheelchair? Thank you ...for your sharing .